For our NY trip, I left all the food research to JS. 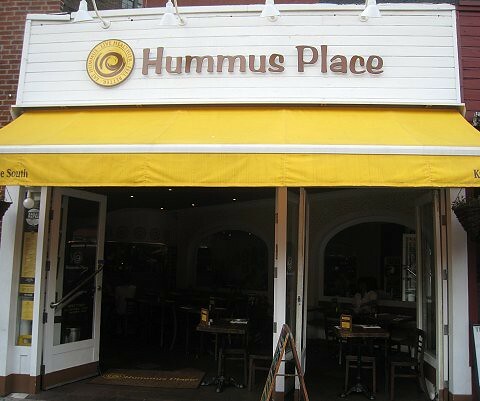 Apparently, there had been a rash of hummus places that have been popping up in the city. While we did plan to stop by one of these places during our NYC visit, we happened upon this location of Hummus Place by chance. 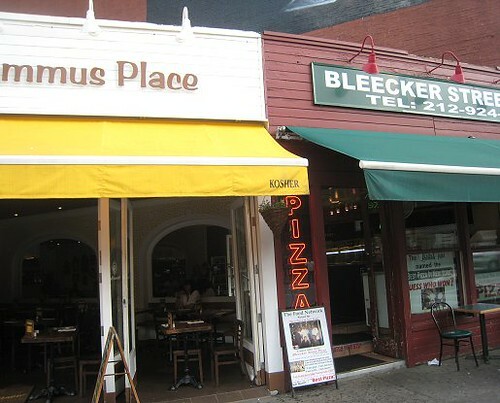 We were having our slice of pizza from Bleecker Street Pizza when we turned our heads and voilà, there was Hummus Place! Look there, they also had shakshuka on the menu! We had just eaten some pizza, but we figured we should get something from Hummus Place as well, since we were there already. We decided we should at least order their hummus (since that's the name of the place, after all! ), and some falafels. How convenient that they had a special which included hummus and one appy! 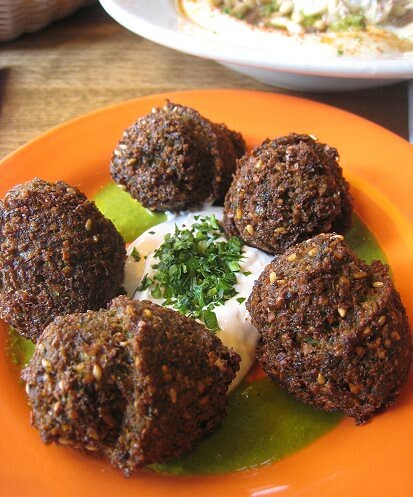 Falafels. I didn't expect them to be herb falafels because the menu didn't indicate so. But, I was pleasantly surprised. They had such a nice, vibrant green color! They were also smaller than falafels I've seen before; more crust to go around. Hummus, served with pita. This is a smoother, more tahini-ish hummus than what we make. (Ours is more chickpea-ish, and very bold in garlic and lemon flavor.) 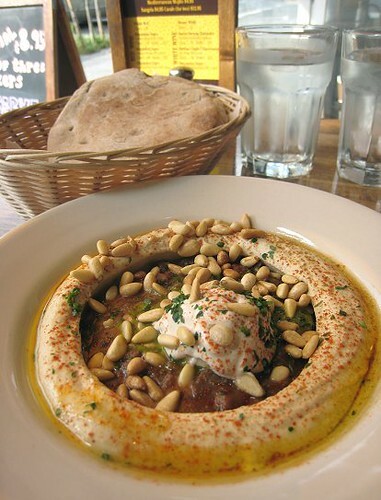 We've seen a similar type of hummus described as Israeli hummus at Gaia Bistro in Vancouver (where we first discovered shakshuka). That there is hot sauce, also nice and green. Poor, poor delivery guy. 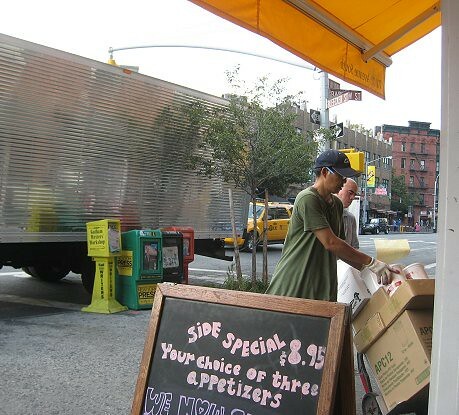 Because businesses in Manhattan don't seem to have loading docks (or back/delivery entrances), this guy had to unload the goods from his truck one hand-cart at a time, and deliver them, one hand-cart at a time, to Hummus Place. He must have gone back and forth, to and from his truck to the kitchen at Hummus Place at least 15 times! Manhattan seems to have a very hard landscape for wholesale delivery guys... and stockroom people. JS and I noticed that businesses usually have their storage underground, with those "holes in the ground" (as we called them) as the means of access. So hard. Anyway, back to the topic at hand. 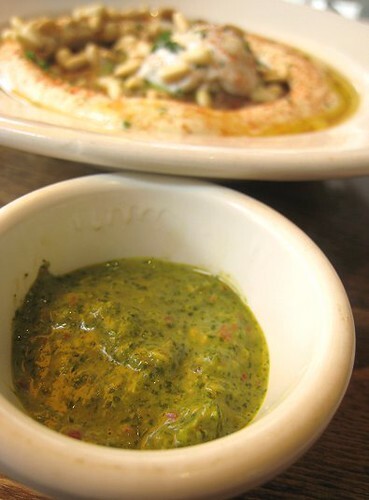 Of the two items, we liked the falafels more, although the hummus was also nice. I wish there places like this here in Vancouver. you may have preferred the falafel over the hummus, but that is one beautiful presentation. woah that falafel is really green! 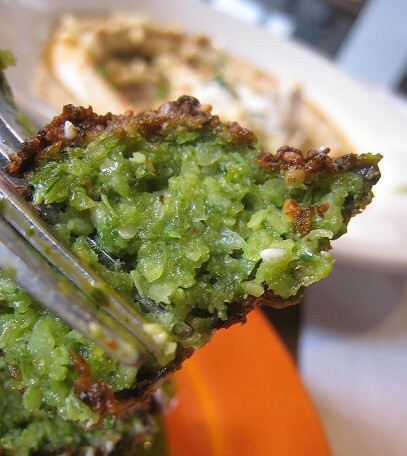 That is the greenest falafel that I've ever seen, and yet I have a feeling that I would love it. So hummus houses are popping up all around? I've never heard of a specialty hummus resto before, and yet the thought makes me weak in the knees. A diner that sells nothing but hummus ranks right up there with unicorns that spit out gold candies and griffins that always lose when you play poker together. Divine. The food was nice indeed. Yeah, the herbs didn't even turn a little "brown-green"! Haha... Yeah, isn't a hummus place the greatest place ever?!! 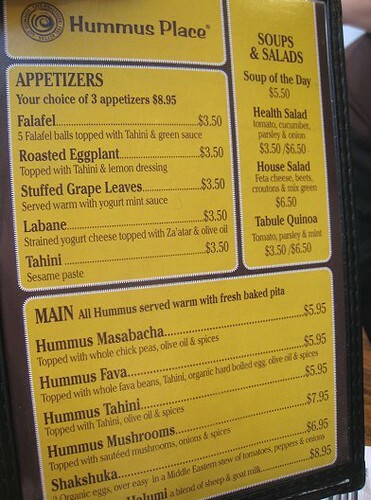 I've never had good service at Hummus Place, last time was the worst -- they brought the wrong dishes out, forgot another one, overcharged us, AND when we tried to pay with a 20, they told us we had to go to the place next door to get change! I know this is more about the food, but I can't help but seperate poor service from the overall eating experience...I found the hummus to be, like you said, a bit strong with the tahini. 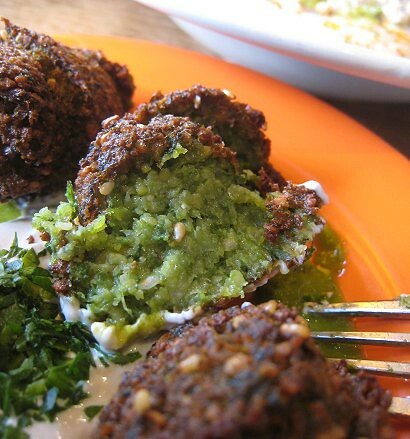 If you are ever in the area again, certainly try yatagan falafel house right down the street. Much more bare bones, but much better falafel, and a delicious filling sandwich is only $2.50!! Glad to see you fit so much in during your trip to NY, always glad to see our guests taking advantage!